What’s on the horizon for ocean freight technology? Extensive media coverage has put the development of drones, and self-driving lorries into the public eye. Lesser known however, is the fact that the development of autonomous ships is also well underway. According to the Royal Institute of Naval Architects, crewless smaller vessels are expected to be in use in three to five years, with larger merchant ships, those carrying oil and heavier cargo, arriving in 10 to 15 years. Some manufacturers behind the development of these vessels believe that they may be in service even sooner. So who is involved in the development of these vessels, and what are the benefits? The economic and environmental advantages that can be gained through the implementation of autonomous ships are significant. With no requirement for crew on board, there are cost savings on wages and the infrastructure needed to support the crew whilst aboard, such as air conditioning, heating, sanitation and crew quarters. What is more, the elimination of these requirements means that there will be more room for cargo. Claims are that such a boat would be 5 per cent lighter and use 12 to 15 per cent less fuel, making it more environmentally friendly. With human error playing a role in the majority of all accidents at sea, the replacement of human control with reliable technology has the potential to also radically increase safety. Not only will this mean an improved safety level for the vessel, but also for those involved in manning it. Autonomous ships will prevent the physical requirement for staff to brace the sometimes perilous sea conditions, instead operating the vessels from shore control rooms. With staff no longer being required to spend months away from home at sea, the development of these ships could well make the ocean freight industry a more attractive proposition to work within. In reality, it’s clear that it’s not going to be all plain sailing when it comes to the introductions of autonomous vessels. Oskar Levander, Vice President of Innovation, Engineering and Technology at Rolls-Royce says the biggest obstacle is regulatory, rather than technical. It’s apparent that autonomous systems would have to meet strict rules on safety and collision avoidance. International Maritime Organisation (IMO) regulations currently require all ships to have a crew aboard. What’s more, on arrival at commercial ports, the navigation of a ship is invariably undertaken by a local pilot who knows the waterways and any dangers they contain. Whilst they will still be able to board the ships on approach to port, a whole new skill set will need to be learnt by pilots as they would need to be trained in how to run an automated ship. There is also the issue of maritime liability. Who would be accountable if the ship were to be involved in an incident? Currently commercial sea vessels have skilled engineering staff on board, essential for taking care of the engines and power systems. What would happen if an automated ship were to break down? Depending on how far offshore the stricken craft is, a repair crew would have to be sailed or flown out. Both costly options. Whilst the risks associated with an unmanned craft with engine failure, drifting in shipping lanes cannot be overstated. Asides from safety, how secure would an autonomous vessel be? Piracy levels are dropping but the taking of hostages for ransom is on the rise. Whilst these statistics would suggest that unmanned vessels would be a good solution as there would be no hostages to take, how would shipping lines defend against pirates boarding and capturing their vessels? Clearly, new defence solutions will need to be established. It’s not just physical piracy that autonomous vessels could be at risk of. The introduction of automated electronic systems over manual operations also poses a fear of increased vulnerability to cyber piracy. 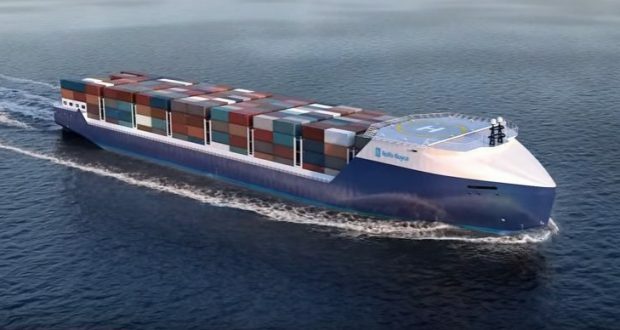 Despite the uncertainty, and clear need for new systems and regulations to be established ahead of any introduction of autonomous vessels, there is a great deal of interest in the development of these ‘ghost ships.’ The European Union has funded a $4 million study to develop autonomous ship concepts, and various companies are working on prototypes, such as shipping research firm DNV’s design for ‘ReVolt,’ a crewless electric cargo vessel designed for short sea voyages, with the capability to carry up to 100 standard TEU. Vessels envisioned by Rolls-Royce would operate both autonomously through computer programming, via human-assisted remote control or, most realistically, a hybrid of both. Rolls-Royce predictions are that unmanned cargo ships could be hitting the open seas as early as 2020, and be fully automated by 2035. As we move nearer to what appears to be a realistic introduction of some form of automated sea vessel, the first designated automated vessel test bed has been set up in the Trondheim fjord, Norway. With the technology already in place, Norway’s Kongsberg Maritime and UK Automated Ships Ltd have teamed together for the development of HRONN, an automated vessel designed for survey, and the delivery of light cargo to offshore installations, which is expected to enter service as early as 2018. How fast and to what extent automation will be introduced across the cargo shipping industry is anyone’s guess, although things appear to be developing at a much faster rate than probably initially envisaged. As the efficiency of ships have improved over time, the level of staffing required to man these vessels has dwindled, with crews of as little as 10 to 15 people required to man the largest cargo ships in service today, and the ongoing development of technology within the industry looks set to influence the continuing trend of diminishing crew sizes. Article provided by our UK Agent “Velta International”, published 23rd March 2017.